She sat next to me at the women’s luncheon – we had assigned seats. The speaker talked knowledgeably, even provocatively, about education but was not nearly as interesting as she. Like most of the women at the luncheon, she was probably in her late 70s or early 80s. We started with the usual exchanges – where do you live – boat or cottage – where are you from – and so on. She said she’d been a corporate pilot. I assumed I’d heard her wrong. “What kinds of planes?” I asked tentatively, just to be sure. Now it was her turn to be skeptical; the look on her face let me know that she thought this conversation would be a complete waste of her time. Well, I come from a family of pilots. Even though I am the black sheep, never having had a license myself, I’ve managed to learn a lot about old planes. So I guess because she thought that maybe I did know a little about old planes, she decided to try me out. 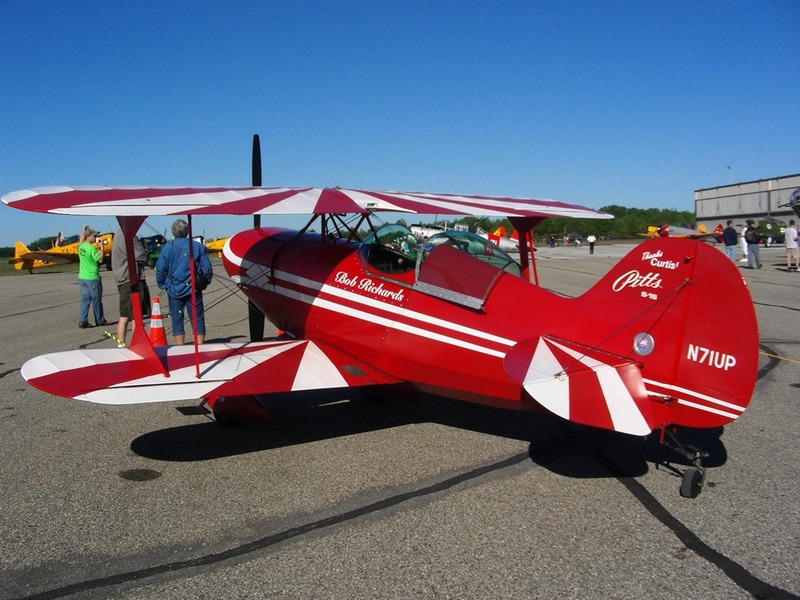 “Have you ever been to Oshkosh?” “Do you know who Bob Hoover is?” “Yes,” and “yes.” [He’d do acrobatics in a production Shrike Commander at airshows we’d flown to in an Aero Commander (a bit bigger); afterwards, my Dad would be inspired to try out his moves: http://airandspace.si.edu/collections/artifact.cfm?id=A20000796000).] She’d met Bob Hoover at an EAA Convention in Oshkosh [http://www.airventure.org/], and he’d invited her to the warbirds’ dinner. “My brothers go to Oshkosh every year – fly their warbirds there.” She said she went to the warbirds’ dinner – she thought they drank a lot. We had a blast talking planetalk and swapping flying stories. She an experienced and skilled professional, corporate and aerobatic pilot; me just a poser. I told her about THE LANDING in Grand Rapids. I tell this story to the passenger sitting next to me on the plane whenever I land at GRR. Probably if no one was sitting next to me, I would just yell it out to the entire plane. My sister was 17 and I was 16. 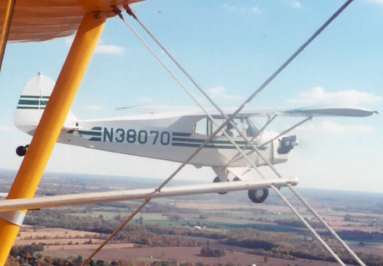 We were flying a Piper J-5 Cub back home from our grandparents’ farm in central Michigan. 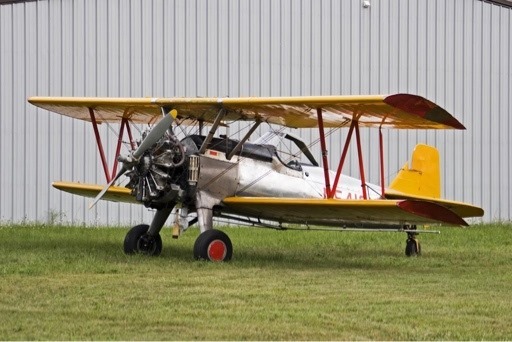 A J-5 is a high wing, fabric-covered, tail-dragger; you sit front and back and have a control stick instead of a yoke. Our dad, mom and brothers were in a Cessna 180 ahead of us. Dad could see a front coming and wanted us to land as we were still 35 miles or so from home. Our radio didn’t work, so he had the control tower give us a green light. But we didn’t know what that meant. So finally he landed and we followed him down. The 180 had just turned off the runway onto a taxiway when the front hit – with 40 mph gusts. The wind whipped his plane around – it was even airborne briefly – and the brakes didn’t catch until the plane had settled onto the grass next to the concrete taxiway. But my sister and I were still in the air, above the runway, and we literally couldn’t get down. She would push the stick forward and down we’d go, but as soon as the wheels touched the runway we’d bounce right back up again. The wind from the front and the speed of the plane on landing were about evenly matched. We were hovering. Somehow she finally got us down and the plane immediately started rolling backwards. Literally, just as the plane landed, it rolled backwards. I jumped out and grabbed the strut to try to keep it from flipping over. Which is exactly what our dad thought it would do. He’d sent my brothers running down the runway to help us. Meanwhile, the control tower had a commercial airliner making circles overhead because they’d had to close the airport. Our little tail-dragger was at a full stop right in the middle of the main runway, with four kids trying to keep it upright. [My youngest brother would have been just about 10 years old.] Once the front went through and we got the plane under control and on the apron, my sister had to go talk to the FAA. So did my brothers. No one lost their license. As my brothers tell the story, they would choose being yelled at by the FAA any day over violating a direct order from our dad. No contest. At all. Here is a picture of my niece, daughter of the 10-year-old, flying the exact same J-5, four decades later. When I got back to the boat I frantically typed an email to my family. My brothers reached out to their flying buddies asking about my pilot friend. No one had heard of her. Finally one of them forwarded a request from a chat room – someone looking for a person of her name who, according to records, owned the first production Pitts Special. He had a log book with her signature in it and an entry in 1973 of “first flight” with a star next to it. So I’ve forwarded that email to her and hope she is able to contact him. Hopetown is filled with these very interesting people who have lived such extraordinary lives. PS In deference to privacy issues, I never identify people in the blog, so the pilot will remain anonymous. 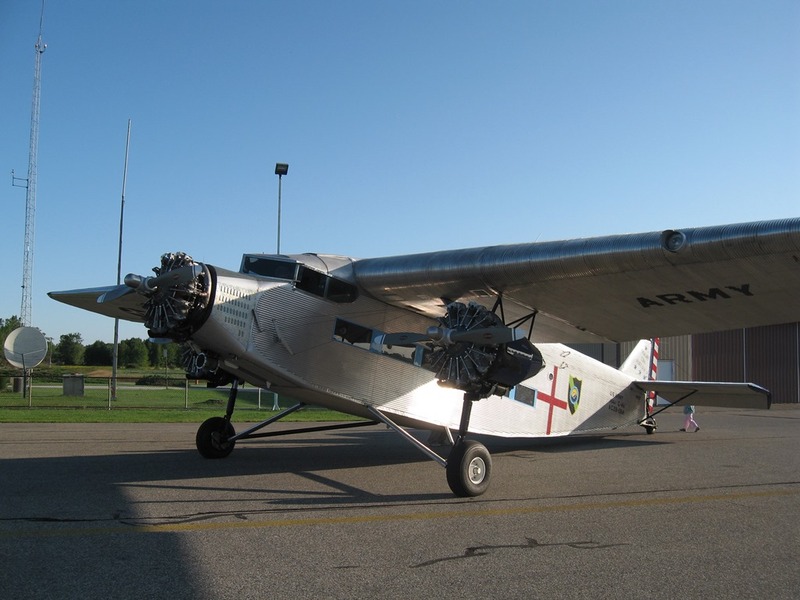 PPS Many thanks to my brother for emailing me pictures of the Ford Tri-motor, Stearman, and J-5, all planes he has helped restore and/or owns (and I’ve flown in). 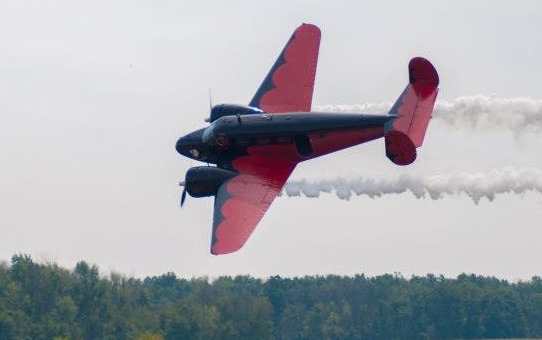 Pictures of the Twin Beech and Pitts are from an airshow my brothers hosted last summer at the airport where they are the FBOs. 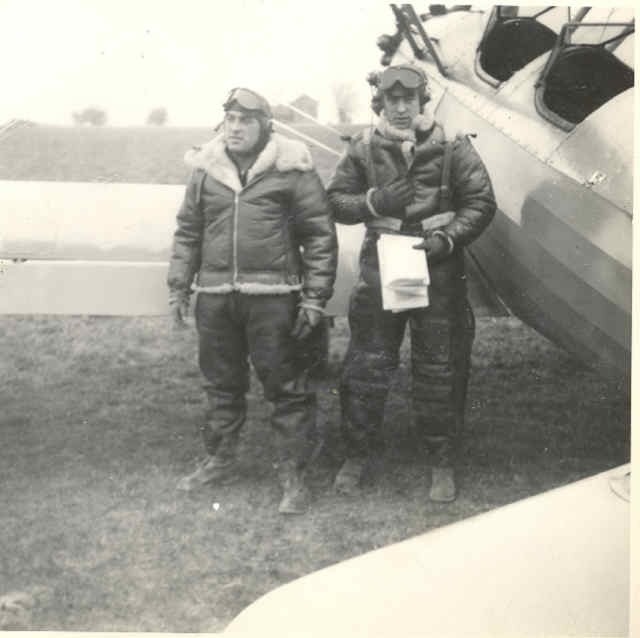 Below are my dad and his brother next to my dad’s Stearman, circa 1945. PPPS I know this blog post has nothing to do with cruising or even boats, but it was really fun. Damn, you are a great writer and storyteller. I love your blog, and tonight I disappeared in your story. As if that wasn’t treat enough, it ended with a picture of my Grandpa next to my favorite plane. Have I told you lately how proud you make me to be a Schiffer? Thank you SO much for your comment. You are the just the sweetest person! I wasn’t sure about posting this, but my conversation with the pilot was so much fun – so was writing the blog post. Thanks to my brother Mike for emailing me the pictures and including the final one of your Grandpa and my Dad. Great stuff. You have outdone yourself, Nancy! Love this blog. You should write a book. Or two. This was fun, Nancy! I passed it along to Ross’s brother in GPP, who owns a small plane and tools around the Midwest in it, as well as to Ross and they both enjoyed it. I also sent it to our son Michael, whose favorite place on Earth, from ages 2 to 13′ was the Air & Space Museum. I know little, but my Dad was an aeronautical engineer diring WWII. Only brother Bradley has transformed the love of planes into flight. THX! So glad you enjoyed this and thanks for sharing.